This easy tomato soup recipe is hearty, flavorful, and fast! 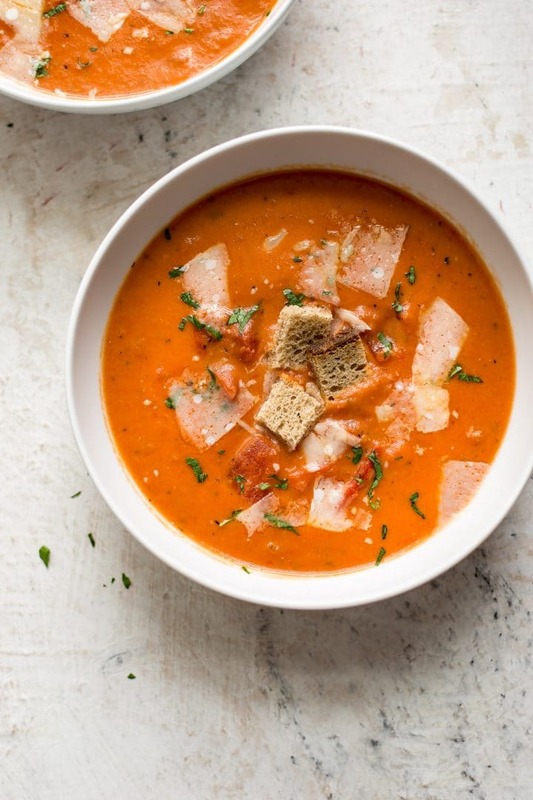 If you’re looking for a delicious tomato soup that’s better than the condensed variety but doesn’t require a lot of effort, this is your recipe. I occasionally make homemade tomato soup, but I never really wrote down my usual method for making it until lately. I’d make it a little different each time and never measure anything out. Well, the stars finally aligned. 😛 I used this particular concoction as base for my tomato tortellini soup, and I loved it so much that I decided to actually write it down make it a standalone recipe on here. My favorite thing about this tomato soup is that it’s pretty thick but also has some tomato pieces in it. This gives it a more hearty/filling and rustic texture than just a standard puréed soup. Oh and it’s very much soup weather here still. This soup isn’t super creamy to me, but I always think a bit of cream makes most tomato soups better. In fact, I do occasionally eat the good ole classic Campbell’s tomato soup, and when I make it, I add less water and a bit of cream to kick it up a notch. What can I say… I always like to put my own little twist on things involving food. Making tomato soup with canned tomatoes is my preference. I just find it so much simpler than using fresh tomatoes, and to me the flavor is all there. Simmer for 8 minutes or so. If adding fresh basil, add it close to when you’re about to serve the soup. So easy and delicious. I’ll make a pot all for myself and eat it over a few days. Dipping fresh sourdough in it = yum. I topped the photos here with a bit of freshly shaved parmesan cheese and some croutons. That’s optional but tasty. And so is serving it with a grilled cheese sandwich. Love comforting soups? Try my creamy tomato gnocchi soup. 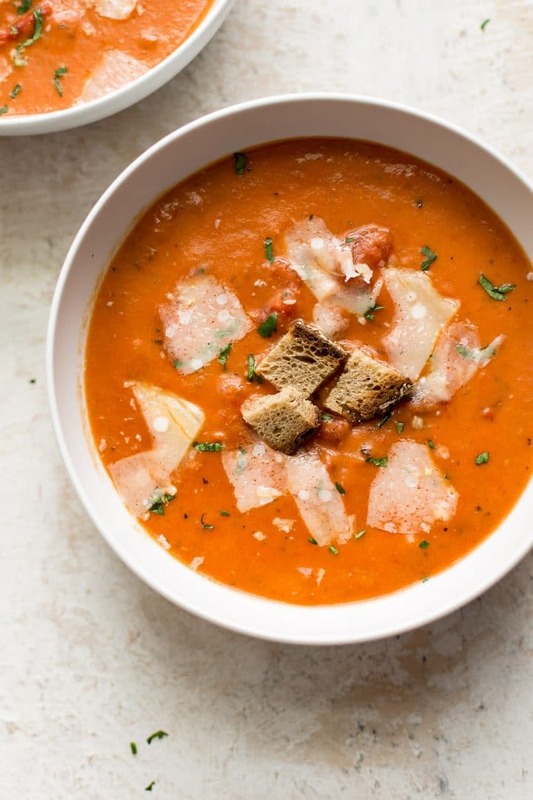 Will you give this easy tomato soup a try? This easy tomato soup recipe is hearty, flavorful, and fast! 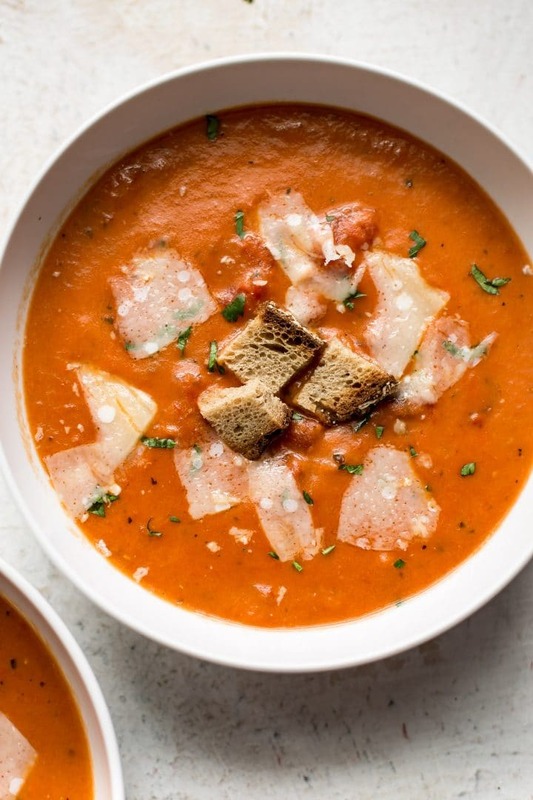 If you're looking for a delicious tomato soup that's better than the condensed variety but doesn't require a lot of effort, this is your recipe. Add the olive oil and butter to a soup pot over medium-high heat. Once the butter has melted, add the onion and sauté it for 5-7 minutes. Stir in the garlic and flour, and cook it for about a minute. Stir (or whisk) in the chicken broth until the flour has dissolved. Add the canned tomatoes, Italian seasoning, sugar, and cream to the pot. Increase the heat to high and bring it to a gentle boil. Once the soup comes to a boil, reduce the heat to a simmer. Let it cook for 8 minutes or so. Season with salt & pepper as needed. If using the fresh basil, add it in a few minutes prior to serving. Serve soup with freshly grated parmesan over top if desired. You could also used dried basil instead of fresh - I use a few dashes and add it in at the same time as the Italian seasoning. This soup is yummy with some freshly shaved parmesan cheese on top!